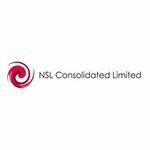 There is only one foreign owned company operating in India’s bulging domestic iron ore market – and that is NSL Consolidated (ASX: NSL). A simple calculation values this purchase order at A$1.3 million. NSL has successfully negotiated better commercial terms than previous orders, and that includes pre-payment, based on 1,000 tonne lots. NSL is currently capped at $69M, but has barely gotten started yet. All of which translates to strong cash flow and profitability – and a lot of further upside in this stock. Of course, NSL’s ongoing performance is not guaranteed, and remains a speculative stock. Investors should seek professional financial advice if considering this stock for their portfolio. Given that the first purchase order is now signed, NSL is actively demonstrating its previously set gameplan. For small-cap resources investors, seeing a brand-spanking new purchase order is a very positive sign, one that could potentially turn into a series of suchlike deals. Or better yet, may even involve an open-ended deal for all of its production. The attraction of NSL is that it has proven its iron-ore grade and quantity credentials, and has now validated its entire business case with its first purchase order, before its Phase 2 wet plant has even been completed. 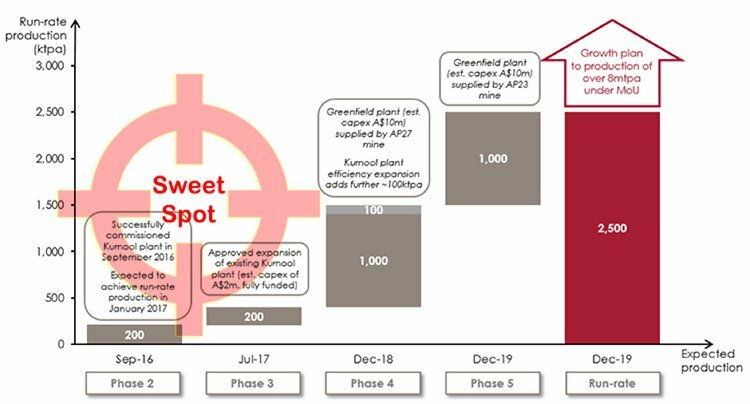 Further out, NSL wants to build a greenfield steel-making plant and a separate pellet plant nearby – allowing the company to extract more from the iron ore downstream value chain. 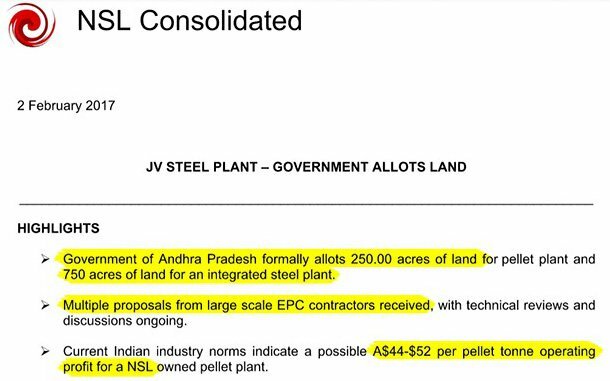 Government approvals are in, with NSL now formally approved to utilise 250 acres of land for its pellet plant, and 750 acres for the steel plant. 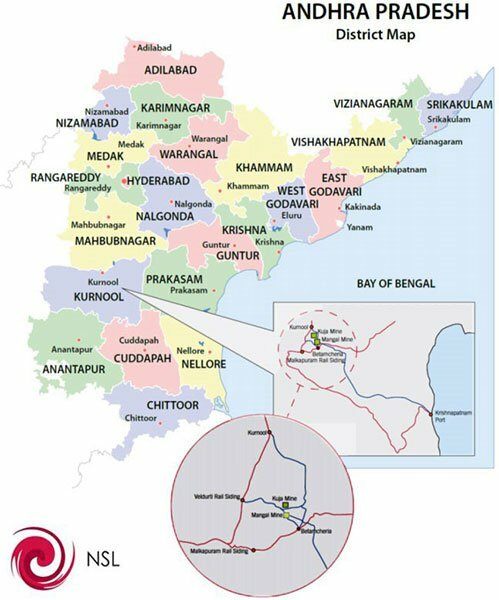 Iron ore prices may be volatile, but NSL has positioned itself to be the only foreign owned iron ore producer in the massive Indian market, with the ability to raise its iron-ore grades up to 65% Fe, a premium product in the local market. 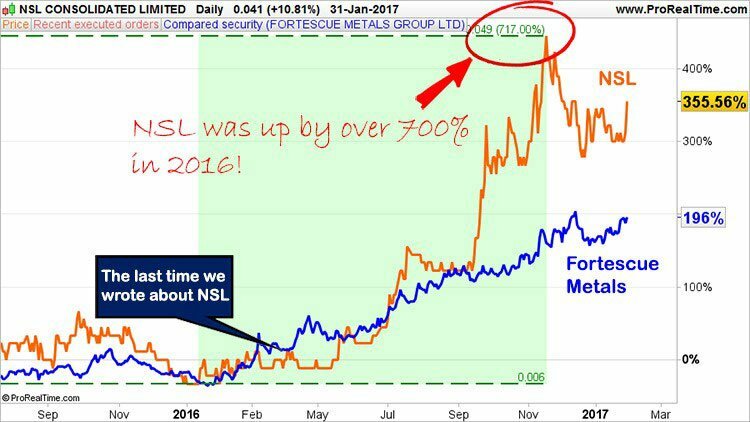 We’ve kept tabs on NSL’s progress from some humble beginnings, first back in 2015 when it was a micro capped minnow, a far cry from today’s $69M valuation. Throughout our coverage , our main focus has been on NSL’s prospectivity and chances of success, so let’s run through where NSL is making its hay, taking into account the most recent developments. 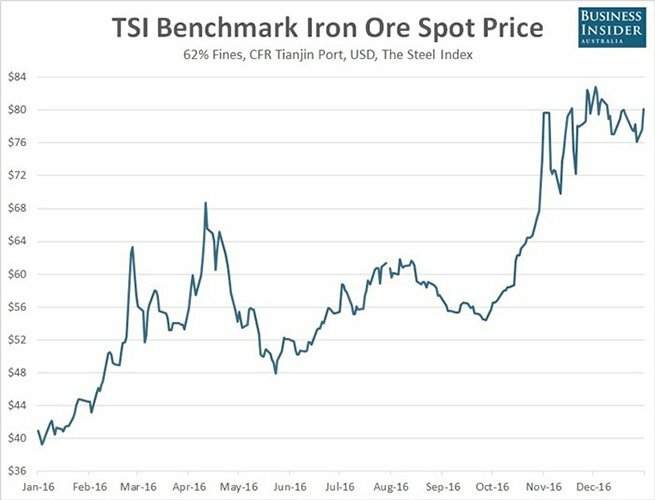 As you can see, iron ore is inching back towards its pre-2014 highs, having begun its reversal last year. However, commodity prices do fluctuate and investors should not make investment decisions based on spot prices alone, and should seek professional financial advice before investing in speculative stocks like NSL. The reasons behind iron ore creeping back into investor favour, is to do with global macro demand as well as regional supply — a range of factors mashing together to create an ideal environment for a mining buckaroo such as NSL, on the cusp of domestic production. 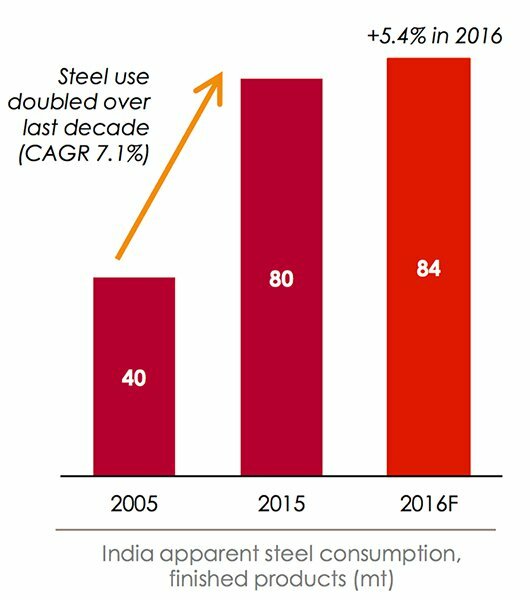 This includes steel production increasing in India as demand for iron ore continues to multiply. What this means is that NSL can capitalise on the growth environment in India as domestic prices increase to meet local undersupply. NSL has developed a strategy to achieve both the necessary grade and produce the required quantity of iron ore to ultimately become a profitable iron ore producer in India. Importantly, NSL is debt free, and held $2.5M at the end of last quarter. NSL’s wet plant aims to take feed with grades as low as 14% Fe, and deliver a product in excess of 62% Fe, and possibly up to 65.3% Fe. With grades all important and a strong determination of iron ore sale price, and NSL having previously targeted a grade of between 58%-62%, the latest grade results indicate additional upside to future sale prices. On the commissioning front, NSL continues to make rapid progress with more operational shifts being scheduled and more ore extracted month-on-month. Three shift operations are due to commence, which means NSL’s production capacity is likely to grow significantly. And why the haste to higher capacity? Well, you didn’t think NSL was in India for charitable reasons, did you? In order to help NSL build the required infrastructure, the company has signed a strategic co-operation agreement with Xinhai – a large Chinese EPC provider. For those unfamiliar with EPC, it refers to the provision of Engineering, Procurement and Construction services – in this case, delivering a wet beneficiation plant for NSL. As we mentioned above, this plant will enable NSL to obtain processing capability to produce iron ore concentrate, with the design ranging between 63-65% Fe. But it will also mean that the company could secure financing for future beneficiation plants, up to a production target of 2.5 million tonnes per annum. Xinhai has completed over 500 similar mining projects, so the confidence level of getting this plant operational is high. Should this crosshair alignment and trigger-pulling endeavour hit its mark, NSL could be hitting the market with premium iron ore grades, operating in the low-cost production environment that India offers. Beyond the current Phase II wet plant, NSL has wider ambitions, including building a steel mill with even greater production capacity. More specifically, NSL is on track to build two separate plants that will produce iron-ore and iron-ore pellets. We like that we’re seeing NSL’s offtake deals and purchase orders beginning to roll in, and we think NSL is onto a winning formula in its quest to commercialise the Indian market. ...and NSL also snagged a further 4,000t purchase order from BMM Ispat. Given NSL’s current rate in acquiring new customers, combined with its broader expansion plans that include a full-scale steel mill and eventually, around 2.5 million tonnes of 65%-grade iron in annual production — we think NSL could be a steed worth backing. So while the company has blossomed over the past few years, it looks like there is some serious upside potential still to come. Inferencing from its most recent estimates, NSL has earmarked an operating profit rate of $44-$52 per pellet tonne, which effectively creates a rather strong buffer for changing iron ore prices, and means that macro-shocks such as the one delivered by China last month , will not impact NSL’s business in any tangible way, especially since the bulk of NSL’s sales will be in the domestic Indian market. In the Indian iron ore market, there is a clear shift towards higher-grade iron ore, which is seeing prices steadily rising, and a move away from low-grade alternatives — ­­which plays directly into NSL’s hands. So, NSL is the only foreign owned iron ore miner in India, in what could end up being one of the top five markets in the world – considering India’s high rate of industrialisation and rampant modernisation plans involve infrastructure – and that means a lot of steel. India’s billion plus population and more than 20 cities currently undergoing extensive modernisation, could lead to its market dwarfing all others... apart from China. Steel use has doubled over the last 10 years, manufacturing share of GDP is set to increase from 15% to 25% by 2022, infrastructure investment is increasing exponentially and there will be US$2 trillion in investment in the next five year into 100 smart cities. The rise of India is coming – and NSL is well positioned to capitalise. Remember it’s the only foreign owned iron ore miner in the country. NSL’s ultimate target is over 2.5Mt of iron ore production per year, but for the time being it is within striking distance of its first 200,000t. 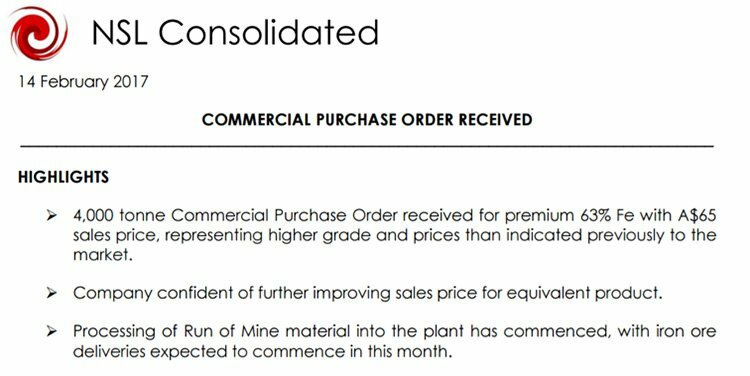 A brief back-of-the-envelope calculation using NSL’s most recent deal figures, shows that if NSL can produce its set target of 200,000 tonnes, whilst fixing a sale price of $65 per tonne — annual sales revenues could be A$13 million per year. If NSL succeeds in raising its production rate to 2.5Mt per year, the company could be looking at revenues in the order of $100 million per year. Of course, revenue numbers are speculation at this stage, based on a number of assumptions which may not prove correct. Investors considering this stock should take all publicly available information into account and seek professional financial advice before making their investment decision. With all the outstanding project caveats gradually coming together for NSL it may explain why this company, capped at $13 million just a year ago, is now valued at $75 million. 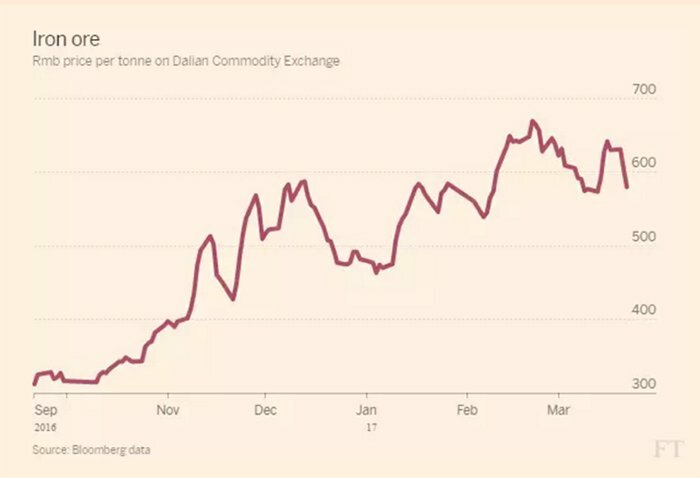 That’s a superb rate of advancement, especially when considering the state of commodity markets in recent years. 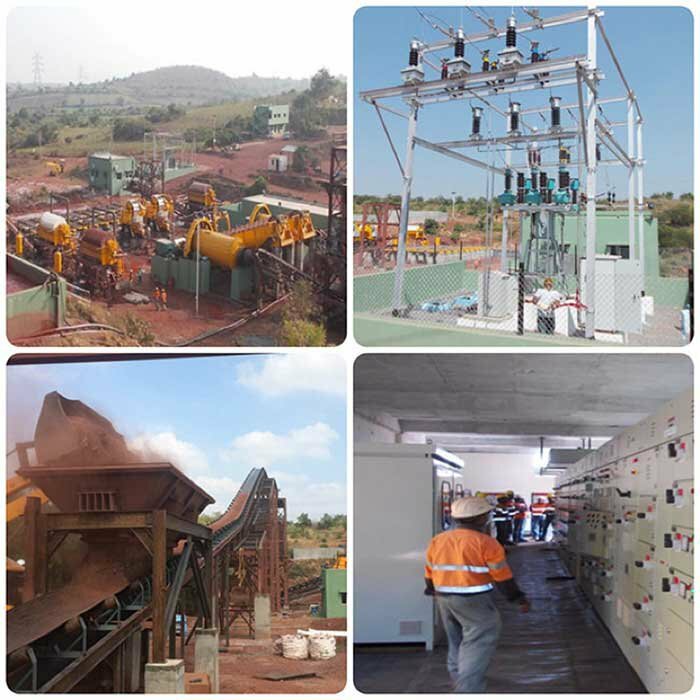 NSL is now on the verge of opening India’s first foreign owned iron ore mine, recording its first iron ore revenues and establishing a clear production path with first-mover advantage attached.